Landaas & Company newsletter April edition now available. The Federal Reserve reported that industrial production slipped 0.1% in March, the second decline in three months. Manufacturing, the largest component, showed no change from February after contractions in the previous two months, marking the first quarterly drop in factory output since the fall of 2017. 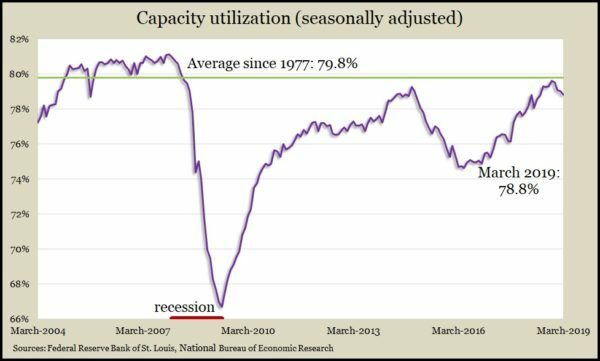 The same report showed capacity utilization, a leading indicator of inflationary pressure, decreasing for the fourth month in a row. The utilization rate has been below the long-term average every month since April 2008. U.S. exports surpassed imports in February, shrinking the U.S. trade deficit by 3.4% to $49.4 billion, the Bureau of Economic Analysis reported. The volatile monthly indicator of trade balance narrowed for the second month in a row after widening five of the previous six months. Overall, the gap between U.S. exports and imports has expanded back to where it was in 2008. Its most recent low was around $25 billion just before the recession ended. The four-week moving average for initial unemployment claims sank to its lowest level since November 1969. Data from the Labor Department showed new jobless applications were 43% below the 52-year average after falling for the seventh time in eight weeks. Claims have been below average every week since the beginning of 2013, underscoring a tight labor market, which should empower consumers to spend more. Consumers pushed retail sales 1.6% higher in March, following weaker showings in January and February. The Commerce Department said car dealers and gas stations led the March increase, the latter boosted by higher gas prices. Among 13 retail categories, only hobby stores had declines. Year-to-year, total sales rose 3.6%, vs. a long-term average of 4.3%. Consumer spending accounts for about two-thirds of the U.S. gross domestic product. Separately, the Commerce Department said business inventories rose 0.3% in March following larger gains in January and February. Although inventory buildups suggest economic growth and factor into the calculation of GDP, recent increases have outpaced sales gains, raising concerns that supply is getting ahead of demand. Since March 2018, inventories rose by 4.9% vs. a 2.4% rise in sales. The Conference Board reported that its index of leading economic indicators rose 0.4% in March, led by components measuring the labor market, financial conditions and consumer expectations. The business research group said its index forecasts continued U.S. economic growth but at a slower pace. The group said GDP should be growing at an annual rate of about 2% by the end of the year. The U.S. housing market continued its slowdown in March as both housing starts and building permits declined in pace. The Commerce Department said the annual rate of new houses starting construction fell to its lowest level since May 2017. Building permits, a sign of future construction plans, have been on the decline for more than a year and are more than 40% below their peak in 2005. Not a Landaas & Company client yet? Click here to learn more.